Will Grapegrowers and Consumers Accept GMO Wines? Would you drink fluorescent green wine? Most molecular biologists-in-training experience their first taste of genetic engineering by transferring a jellyfish gene into (harmless) Escherichia coli, making the bacteria glow green under UV light. One slow day this past winter, my lab-mates and I contemplated the ramifications of transferring that same gene into Vitis vinifera. Fluorescent green wine? Fluorescent green wine! Oh, wait a minute. Do we seriously want such a thing? And has someone already done it? 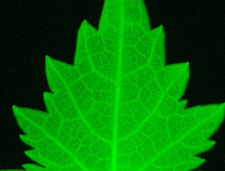 Glowing grapevines are already a reality, though it is the leaf, not the grape, that glows, and the plants are a research tool, not a commercial endeavor. Unbeknownst to most of the wine-drinking world, GMO (genetically modified organism) wine—made with grapes grown from grapevines that have had non-native genes inserted into their genomes—is likely to be on shop shelves in the foreseeable future. This should not be much of a surprise, really. Most of the American corn and soybean crops are already genetically modified. In the US, food products containing GMOs need not even be labeled as such. The question is: will the uncommonly traditional and restrictive wine industry accept GMOs with the same aplomb as other food industries have? Dr. Dennis Gray, a professor of developmental biology at the University of Florida and father of the glowing grapevine, speculates that industry and consumer acceptance may be the most difficult part of bringing genetically modified wine grapes to market. Dr. Gray and his research group have successfully modified—“transformed”—both wine and table grape varieties with genes that make them more resistant to problem fungi and pests. Expressing a specific gene from chardonnay in a Thompson Seedless variety, for example, dramatically improves its resistance to fungal diseases like powdery mildew or sour-bunch rot. The group has had success with a variety of Vitis species, including popular vinifera. The work is motivated in part by the goal of profitably growing grapes in Florida, an endeavor historically plagued by unmanageable Pierce’s Disease, but Dr. Gray sees benefits for growers of both wine and table grapes everywhere. Gray’s group works with a technique called cisgenetic engineering, which means that they engineer grape plants with genes from grapes rather than, say, genes from corn or bacteria or jellyfish (save for those research-only green-glowing vines, that is.) Not only can specific genes be transplanted from one grape variety to another, expression levels can be boosted for genes that might ordinarily be active only part of the time or at low levels. In contrast to traditional breeding, this means that specific traits can be selected without impacting other desirable characteristics (in theory, at least), and the work can be done much faster than traditional breeding, too. Will the fact that only grape genes are being used make a difference to opponents of genetic modification? Maybe, but it is not likely to pacify everyone. Both the Australian wine industry and the California-based Wine Institute have issued public statements against the use of any genetically modified organisms, which would include Dr. Gray’s cisgenetic vines. Other researchers are also working on GMO grapes, and some have received clear indications that their work isn’t welcome. Just last August, members of an activist group called “The Voluntary Reapers” ravaged an experimental GMO vineyard in Colmar, France. The vineyard, capstone to a French National Institute for Agronomic Research (INRA) project to engineer grapevine fanleaf virus-resistant vines, was utterly destroyed. The same vineyard was attacked and damaged, to a lesser extent, in November of 2009. Genetic engineering experiments on grapevines by the INRA had been authorized for five years, ending in 2010, and it appears that the Institute has not pursued an extension. Beyond grapes, yeasts and bacteria used in winemaking are potentially subject to genetic modification, too. 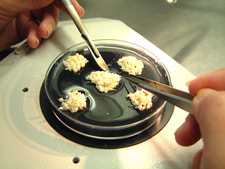 One genetically modified yeast, ML01, has already hit the market courtesy of Dr. Hennie van Vuuren at the University of British Columbia and via distributer American Tartaric. Approved for use in the US, Canada, Moldova, and South Africa, ML01 harbors two bacterial genes that enable it to perform malolactic fermentation. Ergo, this nifty little yeast can drive both alcoholic and malolactic fermentation simultaneously, shortening processing time and eliminating the need for a separate malolactic culture. For winemakers, it means less time and less expense. For consumers, ML01 promises to reduce levels of biogenic amines, a prime suspect implicated in the dreaded “wine headache” (for more detail, see Tom Mansell’s great piece here.) Because bacteria used for malolactic fermentation are a potential source of biogenic amines, eliminating the need for bacteria may be helpful. Anything that shortens processing time, too, shortens the window of opportunity for spoilage by organisms that can also elaborate biogenic amines. Some people are less likely to have hissy-fits over GMO microorganisms versus GMO plants, but the principles at work are the same, and there are some concerns over ML01 and its future kin. The widespread use of commercial active dry yeast already means that the makeup of yeast strains found hanging around in wineries is changing; once a yeast strain is introduced, it is likely to take up residence and become part of the microflora of the winery. GMO yeast with hyper-competitive reproductive and survival abilities could, in theory, make native (i.e. non-commercial) yeast strains endangered species. Is this a problem? Anyone with a general interest in preserving biodiversity has to answer with an emphatic “Yes, it is.” We often don’t know what we’ve lost until we’ve lost it, and more often than not, we don’t ever know what we’ve lost at all. Microbiologists, let alone the average consumer, may not even know if or how close that danger lies. Even though ML01 has been around since 2003, its use is shrouded in a fair bit of secrecy. No winery advertises that they use it, and its distributor won’t discuss its client list. Wineries’ fear of backlash—from consumers, or fellow wineries, or both?—apparently outweighs the potential marketing benefits of advertising that a particular wine may cause fewer headaches. Then again, calling attention to that feature in one wine might induce a customer to think that other wines from the same producers that don’t bear the same claim are more likely to cause headaches. This brings up an interesting problem, i.e., that it is difficult for an objective third party to collect field data on how much ML01 reduces biogenic amine levels in practical use. Another interesting point is that the eight year-old ML01 is still the sole genetically engineered yeast approved for enological use. Is this for lack of demand? Technical issues? Or out of fear that “they” do not want GMOs in wine? Perhaps the most interesting question, at least from a philosophical point of view, is how GMO wine—grapes or yeast—fits into the current enological dynamic. On the one hand, interest in sustainable, biodynamic, organic, green, and/or low-intervention winemaking seems to be at an all-time high. On the other hand, research and technology from ivory towers like UC Davis are constantly making it easier to produce a good, clean, flaw-free product. GMO wine, clearly a product of the second trend, would seem to contradict the first. I, for one, (and perhaps I am excessively scrupulous) would have trouble calling wine that incorporated engineered grapes or yeast a “natural” product. Conversely, however, GMOs could enable winemakers to use fewer chemicals both in the vineyard and in the winery. 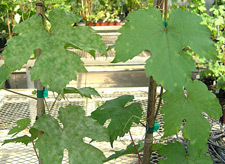 Dr. Gray’s mildew-resistant grapes could translate to less spraying. ML01 could reduce spoilage and, therefore, potentially reduce manipulations intended to prevent or redress spoilage problems. Ways to reduce chemical use inevitably make the green/biodynamic/sustainable crowd happy. The winemaking and wine-drinking communities are not facing these questions yet, but it will not be long. Genetically engineered wine grapes already exist and production needs only be ramped up to a commercially-viable scale. The two major hurdles to be crossed before GMO grapes hit the US market are scaling production up to a commercially-viable scale and approval by the FDA. At that point, of course, it is up to individual vignerons whether or not they wish to grow GMO vines. But is this a decision that wine drinkers should be permitted to make for themselves, too? In the US, foods containing GMO ingredients need not be labeled as such, but products that eschew them can voluntarily boast “No GMOs” Should wine be treated in the same way as any other food product? How many consumers would show preference for a wine certified GMO-free? Green-glowing wine might have a small market amongst the indie-wine-drinking-raver crowd, but I doubt it would ever take off. What do you think? Erika Szymanski was blessed with parents who taught her that wine was part of a good meal, who believed that well-behaved children belonged in tasting rooms with their parents, and who had way too many books. Averting a mid-life crisis in advance, she recently returned to her native Pacific Northwest to study for a PhD in microbial enology at Washington State University. Her goal, apart from someday having goats, is melding a winery job to research on how to improve the success rate of spontaneous ferments. When tending her Brettanomyces leaves enough time, her blog Wine-o-scope keeps notes on why being a wine geek is fun. In addition to my anti-GMO involvement, I also run a wine club. This will be very interesting to see. The people who drink wine just to drink it will probably not care & welcome anything unusual. Those who are actually into wine appreciation will most likely not appreciate anything affecting vines that are hundreds of years old. Funny, we were just talking about GMO wine the other day. We think we can clean up on some farmland for cheap, use resistant modified rootstocks, and produce a lovely product. I proposed to do it as a CSW–community supported wine. It has a real future with people who actually understand the science and the benefits. We were noticing the Jeep ad recently that used “genetically engineered” as a marketing phrase, so it may be that consumers are more ready than some people want to believe on the opposition. Mary, I read the blog post you linked, and you make some interesting points. I completely agree that many people who are afraid of GMOs are poorly educated on the subject. The truth is, however, that many very well-educated people have valid concerns about the long-term implications of GMO agricultural products on genetic diversity, food safety, human and environmental health, and ecological balance. You review only one facet of a many-faceted issue on your post. I hope that the scientific and larger communities engage in a broader and public debate before we as a society embrace an unchangeable path. PLEASE! Do a background on the Monsanto, Round Up, and Pharmacuedical company that is a part of the Monsanto world wide disaster. Also, follow the money. Look at the India reports, the Agent orange disaster they created that they claimed was “Safe”. Along with the many other law suits. Check out the massivly growing rates of cancer and the pandemic episode of Autism in our country since GMO food has been introduced. Do you think it is just coincidental that Monsanto’s people are being placed in the top positions in FDA? Check out the exploding watermelons in China. Befeore you decide on GMO foods, just please consider what other countries are saying. My son is battleing a terrible cancer that used to be very rare and is now becoming very common. That is only one of the cancers that are now growing in incidence at an alarming rate in the US. Incidently, the company that is developing the drugs to treat these highly tumorous cancers is owned by exactly who I thought it would be. The meds only cost $10,000-$13,000 a month for the medications. Of course there are hospital bills that go with their delivery in infusions amounting to about 60,000 a month. They are Gene and Protien specific drugs. Is’nt that interesting now that we have almonst all foods invaded with GMO Genetically altered protiens and genetically altered genes in our food? I will personally drive an extra half hour just to shop to avoid these GMO foods. Also, the mice in the France study did not get tumors until eating the GMO food for about 4-6 months. Many countries are now banning GMO foods and a ban on growing them. They are also causing environmental disasters everywhere. PLEASE read reports from India. I will never touch GMO grapes or wines and everyone I know has realized the dangers to health and environment. Most of the resistance stems from concerns about genetic contamination, but it should not. Grapes have been “cloned” for centuries. A bud of a desired variety is grafted onto a rootstock that can resist soil pests. No grapes are grown from seed except in a breeding program. Chardonnay grows next to Cabernet and there is never an issue of contamination. There are only wild grapes in the US and Middle East, but that has never been an issue except that diseases can move back and forth. Last fall I wrote about the destruction of the fanleaf virus experiment in France. In that case, only the under-ground rootstock was “GMO” and it just expressed the coat protein of the virus that was already present at that site. Grapes are cloned. There is absolutely no issue with genetic contamination! @Erika: well, if you really cared about biodiversity you would oppose all farming–because that’s a giant assault on biodiversity, on purpose. But if you are going to farm (and I do support farming), using fewer chemical pesticides is high on the top of my list of good things for the planet–and for non-target species. Better yield with less waste is also up there, to reduce the amount of land used for farming and to feed more people. Many of the “many-faceted” issues around this topic are actually nothing to do with GMOs, and many people falsely condemn them because of their tunnel-vision on that, when many of the concerns are related to other aspects of agriculture. Mary, my worldview says that humans are called to be stewards of the earth, which means caring for it and using it responsibly. As with most things, it’s a matter of respect and balance. Back to GMOs, I must say that I seriously doubt that the majority of anti-GMO concerns are unrelated to GMOs. Can you give us a few specific examples? Monocultures are often claimed to be an issue of GMOs, and they were an issue long before GMOs. Food safety is not a GMO issue. Human and environmental health–please show me where this is a GMO issue–with actual scientific sources and not just crap off of some website. And ecological balance–what component of this is unique to GMOs? Please illustrate (with credible sources) the GMO-unique aspects of this. I would like to draw your attention to the fact that the GMO yeast ML01 is not approved for use in the South African Wine Industry. Gerard, thanks for the correction. Steve, while an awful lot can be done with ordinary yeast selection, developing an enzymatic functionality that isn’t found in the genus requires engineering for all practical purposes. My guess is that’s a main reason why ML01 is the only GMO yeast currently on the market. Mary, you know as well as I do that what you’re asking for is a lot of work. I’m away from my source materials for the summer, and I have faith that no matter what sort of evidence I provide, you have already made up your mind and have no intention of changing it. For that matter, your own website makes plenty of statements that aren’t substantiated with the sort of information you are asking me to provide. If I have time come mid-August, I’ll get back to you. My own website where? Can you be more specific about these unsubstantiated claims? If you refer to the link I gave where we were engaged in a discussion–that’s not my site–just like here, we are discussing things and this site isn’t mine either….? I’m asking for a lot of work for you to substantiate your claims that GMOs have all these awful and unique problems–which are not common to other aspects of agriculture? Your article makes the claims. What part of the world are you in where you don’t have access to the sources? I’ll keep checking in–sorry to be making you do all that hard work of backing up your claims. Still mid-August. Don’t be shy. Like cork vs screw cap the take off for consumers most probably will depend largely on timing and cost. If GMO wines can provide same quality for lower prices then casual drinker generally won’t know the difference however, for old faith-full’s and those in the industry of wine appreciation GMO will most probably always stir debate.